The Black-bellied whistling duck, called also Black-bellied Tree duck, Red-billed Tree duck and Red-billed whistling duck (Dendrocygna autumnalis Linnaeus, 1758) is a beautiful and elegant duck belonging to the group called “dendrocygns”, belonging to the order of the Anseriforms (Anseriformes), to the family of the Anatids (Anatidae), to the genus Dendrocygna and to the species Dendrocygna autumnalis. There are two subspecies: the Northern black-bellied whistling duck (Dendrocygna autumnalis autumnalis Linnaeus, 1758) and the Southern black-bellied whistling duck (Dendrocygna autumnalis discolor P.L. Sclater & Salvin, 1873). The name of the genus “dendrocygna” comes from the Greek “dendron” = tree and from the Latin “Cygnus” = swan. It means therefore “arboreal swan” with reference to the arboreal habits (much present in Dendrocygna autumnalis) typical of some of the species belonging to this genus and with reference to the peculiar appearance of these ducks, which somewhat remind the little swans. The name of the species “autumnalis” comes from the Latin “autumnalis” = autumnal with reference to the great presence of these ducks, rightly in autumn, in the corn fields and in some areas where they are absent for the rest of the year. The black-bellied whistling duck is an American species present in the southern part of USA, and in the tropical and subtropical zones of Central and South America. In the USA it is generally a migrant species; it can be found as sedentary during the whole year in some zones of south-eastern Texas. Seasonal in south-eastern Arizona and in Louisiana. Erratic species, rare and vagrant in Florida, South Carolina, Georgia, Arkansas, etc. In the rest of the distribution area, locally, it gets dispersed, outside the reproductive period, looking for food. 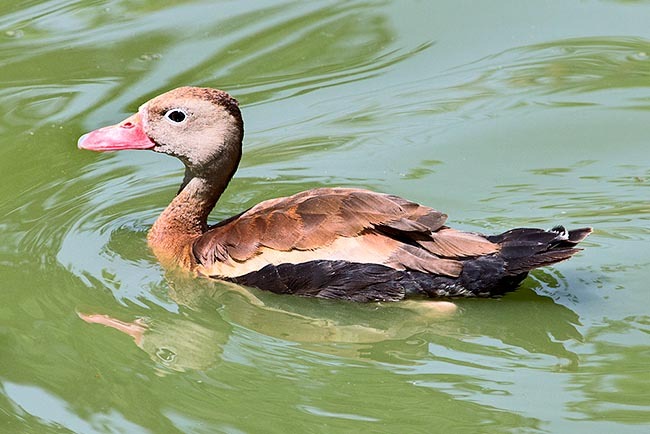 The two subspecies converge in Panama, where the northern black-bellied whistling duck (Dendrocygna autumnalis autumnalis) may merge with the southern black-belied whistling duck (Dendrocygna autumnalis discolor). The species is mainly sedentary but in the extreme north where the reproductive areas are abandoned and the birds become vagrant southwards going to Mexico for hibernating. 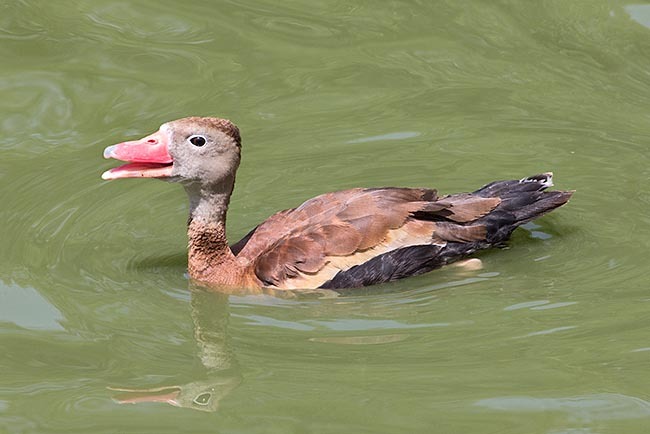 The northern black-bellied whistling duck is distributed substantially in the southern USA and in Panama; the southern one from Panama, Paraguay and adjacent areas southwards. Species with neo-tropical and neo-subtropical distribution, the black-bellied whistling duck has been able to colonize semi-arid areas in southern Arizona and in south-eastern Texas. This thanks to the exploitation of small water reserves, such as pools and ponds for watering livestock and other artificial water surfaces (ponds of golf courses, etc.). The low winter temperatures, however, are a limit for possible future expansions northwards. It is distributed from the low plain locations, with presence of slow-flowing water and shoals, to the slightly wooded lands and up to about 2500 metres of altitude in the Eastern Andes. The black-bellied whistling duck has the classical shape of the dendrocygn (please see the texts of the Dendrocygna bicolor and of the Dendrocygna viduata) with an even more lanky and upright shape with postures almost like a heron (family Ardeidae). It’s about 45-56 cm long and has a weight of 640-1020 g, the wingspan is of 75-95 cm. It is the only dendrocygn having a bill neatly distinct and distinctive, in respect to that of the other congener species, of a bright red colour. This bird, rightly due to its bill, is often called “red-billed whistling duck”. The bill, luminous and waxy, actually is reddish-pinkish or orange-reddish and is often yellowish at the base (dorsally); the nail of the bill is greyish. The bill, and a white periocular ring, are two very evident characteristics in the specimens when seen from near. The head, excluding the top, and the beginning of the neck, is of pale beige grey colour. The vertex is more brownish and can get the same brown colour as the back. The second part of the neck, the chest, the back and, transversally, the base of the wing (wing coverts), up to the alula have a nice lively brown-reddish colour (with darker brown areas). Tail and over-tail are blackish-very dark brown. The undertail is whitish, more or less stained black. Dorsally, the wing has an ample black terminal band interesting good part of the remiges; the central part of the wing included between the brown oblique part and the black terminal one (at the level of the secondary remiges), is white and stands out very much when the bird is flying (identifier of the species). The ventral part, after the brown chest, is black as well as the whole underwing. The legs are of luminous pink/orange red colour with grey nails. The southern subspecies (Dendrocygna autumnalis discolor), slightly smaller, differs from the nominal subspecies, as having grey chest, neck and upper shoulders. The juveniles have grey bill, greyish legs, colouration duller than the adults, greyish-white abdomen instead of black. This duck, like all other species of dendrocygns, carries out only one annual moult and therefore does not present seasonal variations of plumage. The sexes are similar. The iris is brown-very dark blackish. It is a species vocalizing a lot during the flight, especially during the night one; the cries are prolonged, screeching but also chirping, so much to be considered as standing among the most musical cries emitted by an anatid. Their sweet whistle “pe-che-che-ne” has granted the species the natives’ name of “Pichichi”. It is a species less aquatic than the other dendrocygns and very rarely frequents deep waters. These ducks fly with agility through woody areas and rarely get away from the trees. They commonly perch on trees in the swampy zones or close to the banks utilizing, as perches, preferably dead branches positioned on the top in way to better observe the surrounding habitat. Alternatively, they perch on live and low branches placed over water streams which may confer security. They move in large vociferous flocks between the places where they nest and those where they feed. The diet is substantially vegetarian, as well as the other similar species, but nourishes also of aquatic invertebrates (please refer to the text Dendrocygna bicolor). The flock usually feed in the cultivated fields, especially the corn and rice ones, being considered, in some regions, as harmful animals. These agile ducks are capable to skilfully perch on the maize plants so much to get an umpteenth Mexican name: “maisero”, which means “duck of the maize”. The nests of the black-bellied whistling ducks are done in the hollows of the trees even if some metres high over the soil and, less frequently, on the ground in the low vegetation. The species willingly utilizes also the artificial birdhouses and, occasionally, chimneys, abandoned dwellings or other birds’ nests. It is not unusual to find nests with eggs spawned by more females; these nests may contain 60 and even more eggs! (which cannot be functionally hatched). 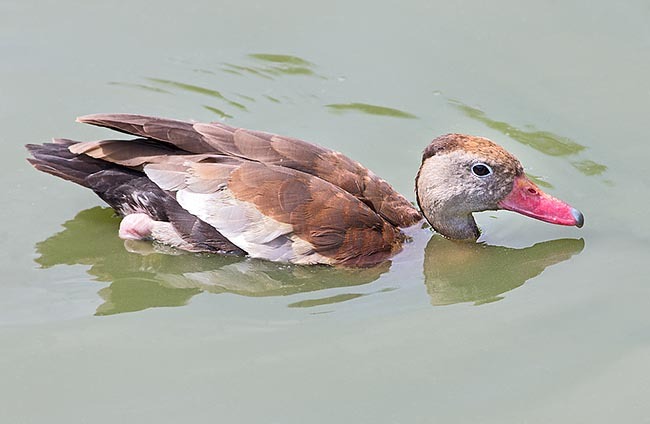 When in the same habitat are present also the Muscovy duck (Cairina moschata) and the Wood duck (Aix sponsa) the competition for the nesting cavities penalizes the black-bellied whistling duck. The reproductive season is very long and in some localities the species is able to do two successive nidifications. The black-belled whistling duck is markedly monogamous and the pair may keep united even for several years. The eggs are roundish, of marble-ivory white colour, and the hatching lasts about 24-25 days. Both members of the pair care the chicks for about two months. The ducklings of these species are lovely: they have a contrasted yellow-brown of slightly downy look colouration, mottled on the body and striped on the head. The geometry of the livery of the ducklings gives them a general appearance to the same recalling that of the wasps (family Vespidae) or, even more, that of the bumblebees (genus Bombus). Even if the total population is estimated to be of about one million/one million and a half of individuals, the species is submitted to great venatorial stress. In captivity, the black-bellied whistling duck is bred and appreciated. Also the local populations of Latin America bred it along with the domestic poultry for using it as “duck guard”. In the amateur collection the northern subspecies (Dendrocygna autumnalis autumnalis) is more commonly found and only occasionally the southern (Dendrocygna autumnalis discolor) one. It is easy also to find some intermediate forms resulting from the crossing between the two subspecies; in this regard it would be desirable if the serious breeders could breed separately the two subspecies in order to maintain high the biodiversity of these splendid and cute birds.